1. Ugh. It looks like Disqus isn't working right now on my site, so if you have tried to comment and couldn't, I'm sorry. I'm working on it. Hopefully it will be up and running soon. 2. 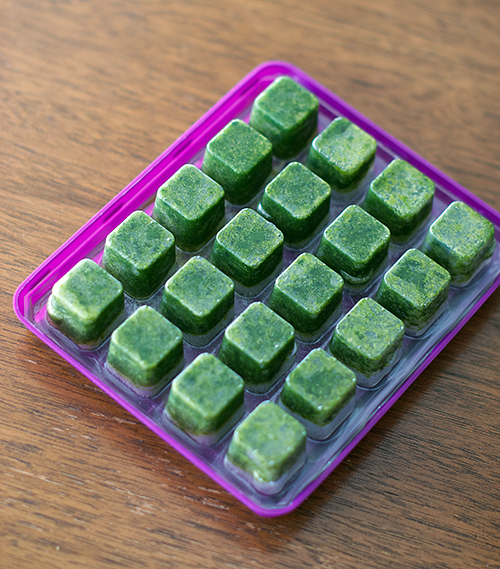 Have you ever tried using frozen fresh basil cubes? I think they are kind of awesome. They taste like fresh basil but require no chopping and have a long shelf life in the freezer, which is something I can't say for the fresh bunches in my fridge. Dorot is one brand I've seen around at natural food stores, and Walmart has some from a different brand. I highly recommend perusing the frozen section of your local grocery store for some next time you are shopping. 3. 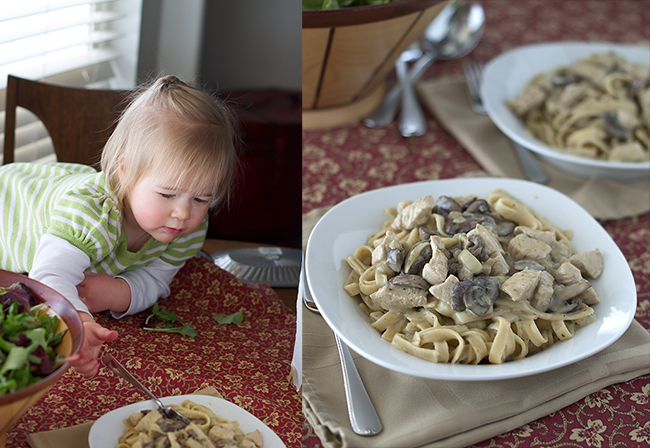 Speaking of basil cubes, I just used them the other day to make chicken basil cream pasta that was to die for. My little taste tester and I couldn't stop eating it. I was afraid she wouldn't let me get ANY pictures of it, but luckily she had to take a break from stealing noodles to actually chew and swallow them. 4. I know it is weird, but I have a strange dislike of paper towels. I love them at times, like for patting dry raw chicken pieces or squeezing excess liquid from cooked spinach, but most of the time I feel like a regular towel just works better. Problem is, regular towels aren't nearly as convenient as paper towels. 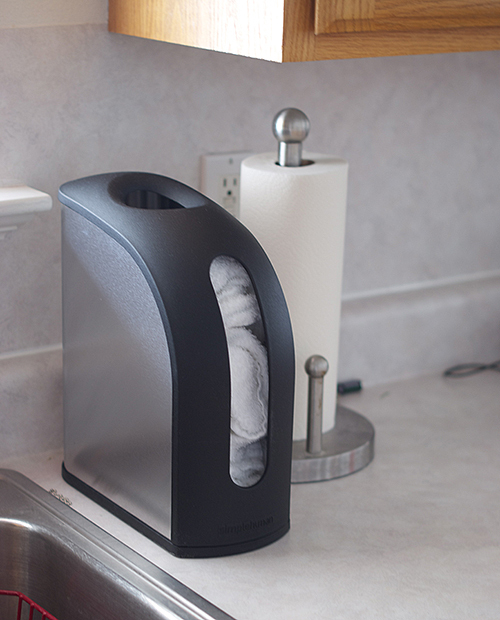 Enter my solution - a countertop towel holder. Officially it was sold as a grocery bag holder, but we've been using it for the past week or so for regular ol' towels and it seems to work pretty well. As you can see from the picture, we still haven't given up on paper towels entirely, but for tasks like drying off hands, wiping up spills, etc. the cotton towels are doing a great job and having them so convenient has really cut down on our paper towel usage. My husband rolls his eyes a little about my paper towels quirk, but he's been a supporter of the new towel system so far. We're going to test some microfiber towels in there next week and see if we like them better than the plain cotton ones. I'll keep you posted. 5. Have you ever been so proud that you bought chicken breasts on sale, with a coupon, making them the deal of the century? 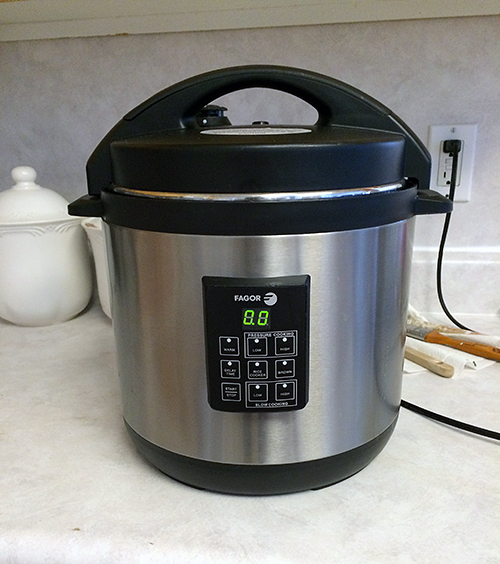 And then cooked them in your pressure cooker to have them ready for meals that use already cooked chicken breasts and left them in overnight by accident so you wake up to ruined chicken in the morning? Anyone? Yeah, um, me neither. Let's see if this comment sticks! I will have to look for that frozen basil - I am with you when I buy it, it sometimes gets pushed back in the fridge and by the time I see it again, its black! I am spoiled, because my store routinely sells 10 pound bags of fresh boneless skinless chicken breasts for $1.29 a pound! Enjoy your Sunday - your baby girl is getting so big! I really need to try those frozen herb cubes. I waste herbs like crazy because I guess I don't cook enough? Amelia has sure grown! She's just adorable. I love your posts. They always make me smile and sometimes laugh and I always learn something. Your daughter is adorable. haha about the chicken! I've seen those cubes, but never bought them. I'll need to give them a try!